Sony unveils giant 785in 16K display | What Hi-Fi? If you think 8K is pretty advanced, feast your eyes on Sony's massive new 16K display. With a length of 19.2m, it's longer than a bus, the BBC reports. And measuring 5.4m high, it's about as tall as a giraffe. It has 16 times as many pixels as a 4K TV, and 64 times that of an HD set. Sadly, though, it's not for sale. It's being installed in a research centre belonging to Japanese cosmetics firm Shiseido in Yokohama, south of Tokyo. It's so large it will span two floors and show content specially created by Sony. 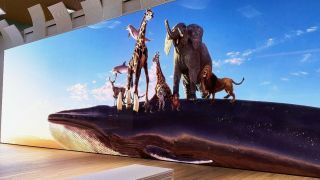 Sony announced the screen at the National Association of Broadcasters (NAB) trade show in Las Vegas. It was created by joining together many smaller screens. Because they're bezel-less, they fit together seamlessly to form one massive display. The display uses Sony's Crystal LED tech, the Japanese firm's take on Micro LED. It doesn't need a backlight, and claims to go much brighter than OLED while still delivering similar black levels. 8K TVs such as the Samsung QE65Q900R have hit the shops, but - in the UK at least - they rely on upscaling HD and 4K content to 8K resolution. 8K broadcasts have started in Japan, and next year's Olympics will be broadcast in the format but any 16K consumer content seems light years away. We'd still like to see it in the flesh, though.